The Urban Rebounder Trampoline is specially designed for those of us who want to get and stay in shape. It is a moderately-priced product that can work wonders for the right users. Our review will take a look at this product’s specifications, top features, pros and cons, and other aspects. Moreover, we’ll also highlight a short clip that showcases several different ways in which this product can be used. And as a bonus, we’ll offer you a step-by-step guide to how to assemble the Urban Rebounder. The Urban Rebounder meets certain safety standards to ensure that it is stable and strong enough for people of different body weights. In fact, it has one of the highest weight capacities of any exercise trampoline on the market. Here is an insider look at its specifications. While most trampolines are built for fun, the Urban Rebounder should only be used for exercise. That’s because it is a little too small for play and is not safe enough for children to play on it. However, they can use it to exercise as long as their parents supervise them. As for the stability bar, it will help keep them on the mat without slipping off of it. Adults interested in doing moderate-to-intense exercises at home should definitely try this model out. However, this model is best for individual use and not for gyms as it’s a little too small to be used professionally. What’s more, it’s not sturdy enough to withstand dozens of uses over a single day. On the other hand, it should last for years if a single person uses it for 30-60 minutes a day. Probably not the best choice for kids. You might fall in love with it, but this product will come in a package of loose parts and pieces. Therefore, you should learn how to set up a trampoline from scratch before you actually try to do it. Here’s what you need to do. Check the connections to ensure that they are fully connected and not loose. In this comparison video, you will learn what made the Urban Rebounder trampoline one of Consumer Reports’ top 100 products of the year and get a real-world example of how to use it. While it might seem a little cheesy at times, the clip is a great tool for learning how to use this exercise trampoline properly and efficiently. Strong rubbery smell when the product is new. But, a large number of reviewers are very positive about it. Heavier users (such as those around the 200-pound mark) believe that it is stable and sturdy enough for them. They have also reported enjoying the DVD for helping them stay motivated and exercise regularly. Other users have noted that they had no problems with the springs, even though this issue is the most common complaint about this model. All in all, we believe that the Urban Rebounder trampoline’s price and quality build make it a good choice for most buyers. However, before making a purchase decision, take into account the most common user complaints to see if this product is truly right for you. 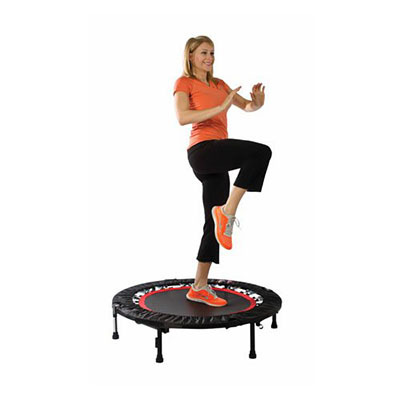 Have you tried this exercise trampoline and have an opinion about it? Share it with us in the comments below.